Fearlessness is usually considered a virtue but it does come with it’s own set of challenges. 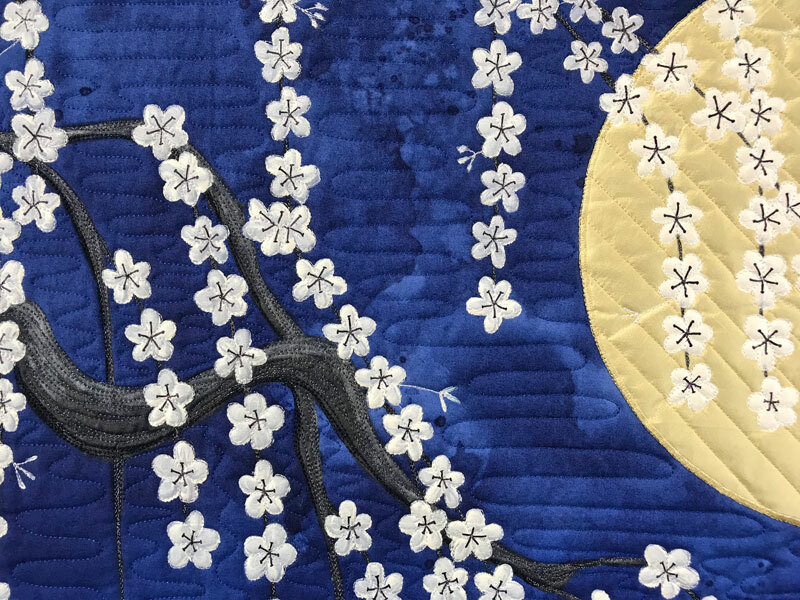 I had long pondered the idea of doing a nighttime cherry blossom quilt. I had envisioned the moon shining through the long weeping branches and reflecting on the water. 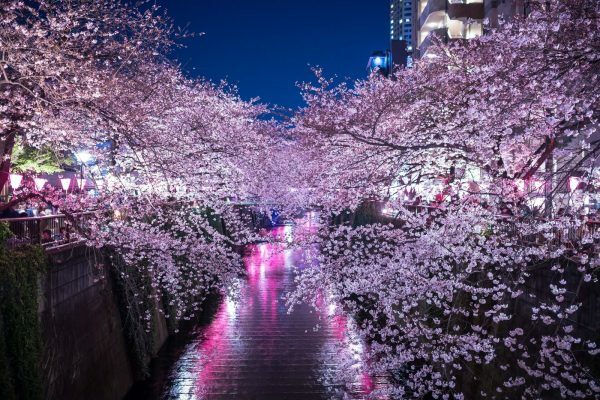 Cherry blossom season is very important in Japan. It’s a time to celebrate the incredible beauty of the season. People dress up in traditional Japanese clothing, pack their picnics and go to the park to sit and admire the amazing beauty. This beauty also represents the fleeting quality of life. It’s so beautiful but it’s also a very short season. You must go out and enjoy it now because it won’t be here long. 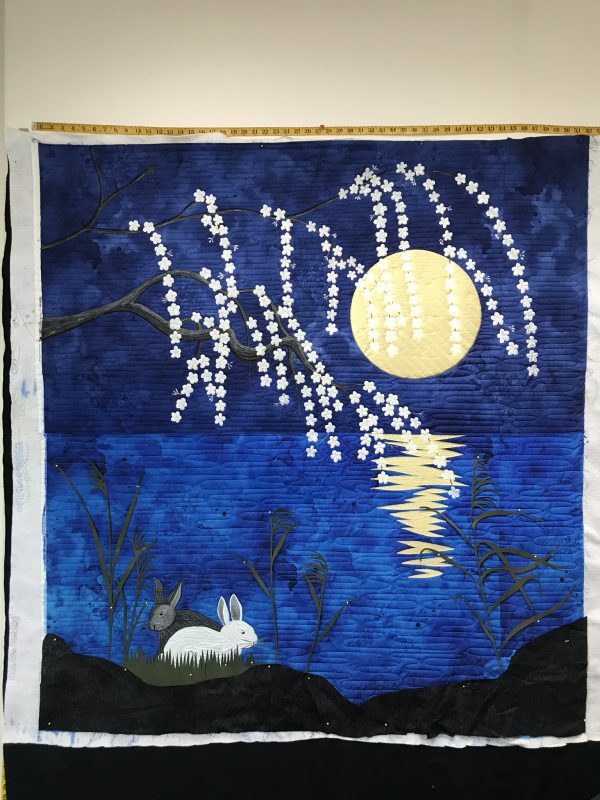 I recently completed this Usagi quilt (Usagi means rabbit in Japanese) after some weeks of incredibly intense work. 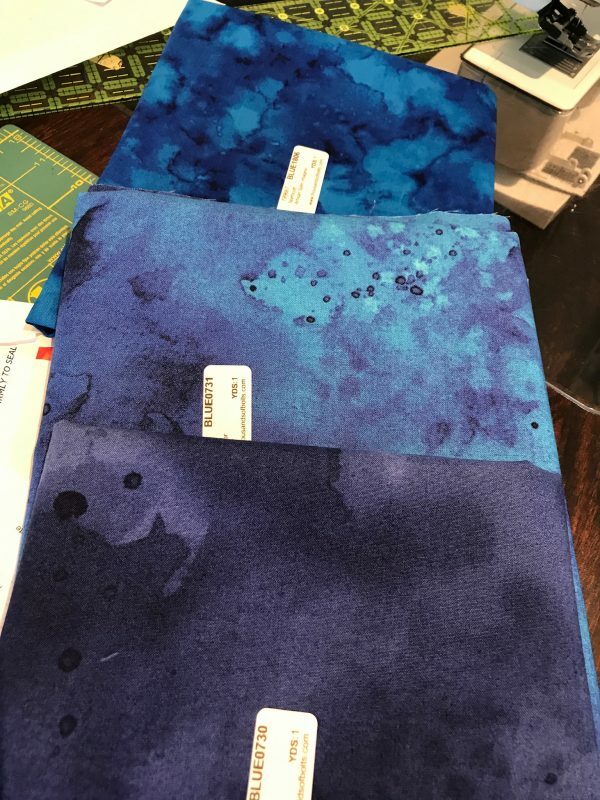 I intended this to be a brilliantly blue quilt so I ordered the most beautiful blue Moda Watercolor prints from Thousands of Bolts. I chose the bottom two in this photo. The top one didn’t play well with the others so I abandoned it to be used in another project. When I pieced them together it took me awhile to decide which color should be the sky and which should be the water. Something just wasn’t right so I mixed up a a very thin color wash with my transparent fabric paint from Pro Chemical and Dye. 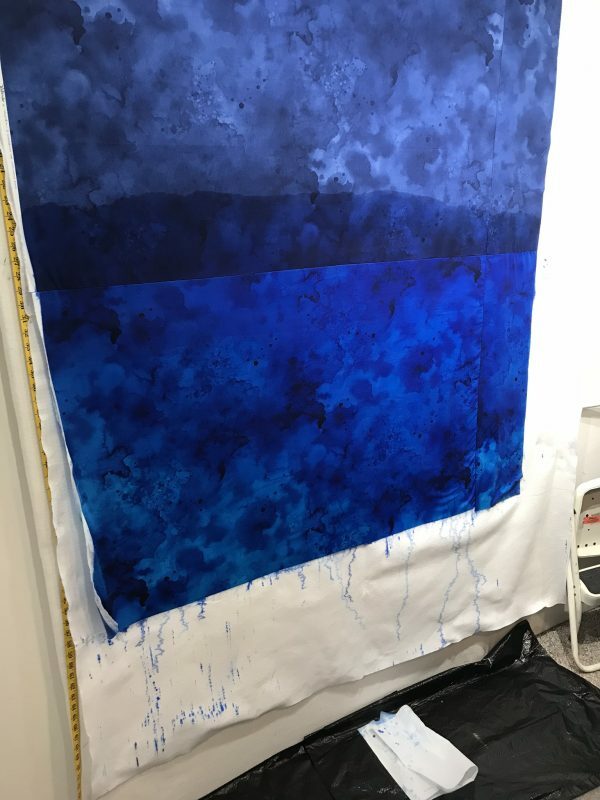 The lighter color was just too light so I pinned my batting to the design wall, pinned the blue fabric on top of that, laid down some plastic bags and gave it a good color wash. This was taken when it was still dripping wet. 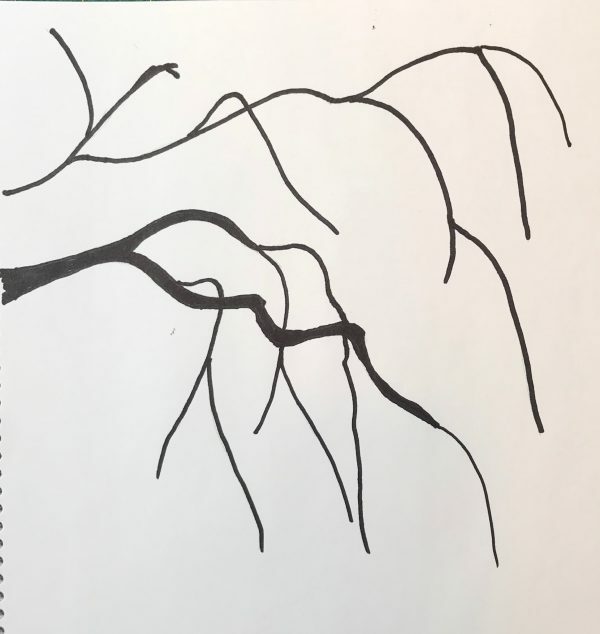 In the meantime, I looked over my Pinterest board full of cherry blossom images and sketched out some weeping cherry branches. I made it into a line drawing with Sharpie marker and scanned it into my Cricut cutting machine software. I then had to divide it into sections until I could get the scale adjusted to the right size. I had the machine cut out freezer paper which I then pinned to the wall. You can see the paint had now dried and the colors looked great together. 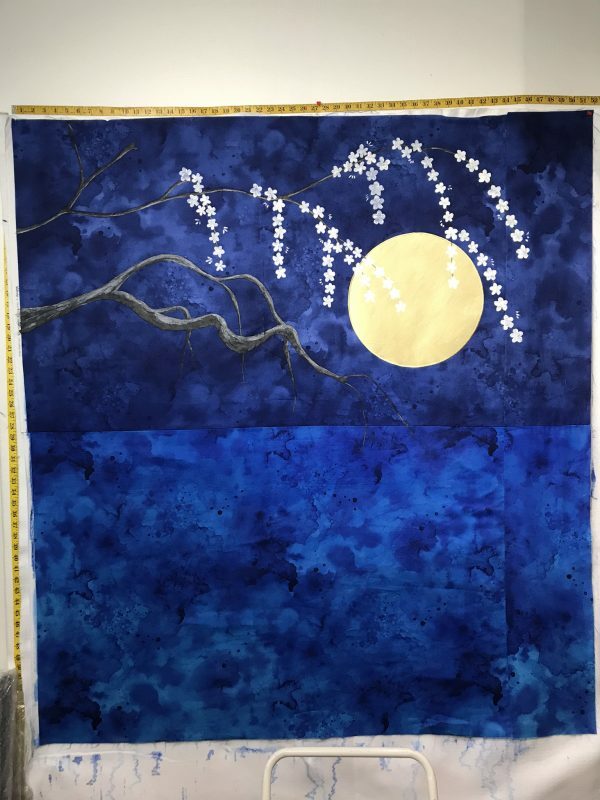 The next step was to applique the silk moon since it would be shining through the branches. I used a zig zag stitch on the widest setting and very small length (.02 or .03). This is called satin stitch applique. You can see the stitches in this detail image of the finished quilt. 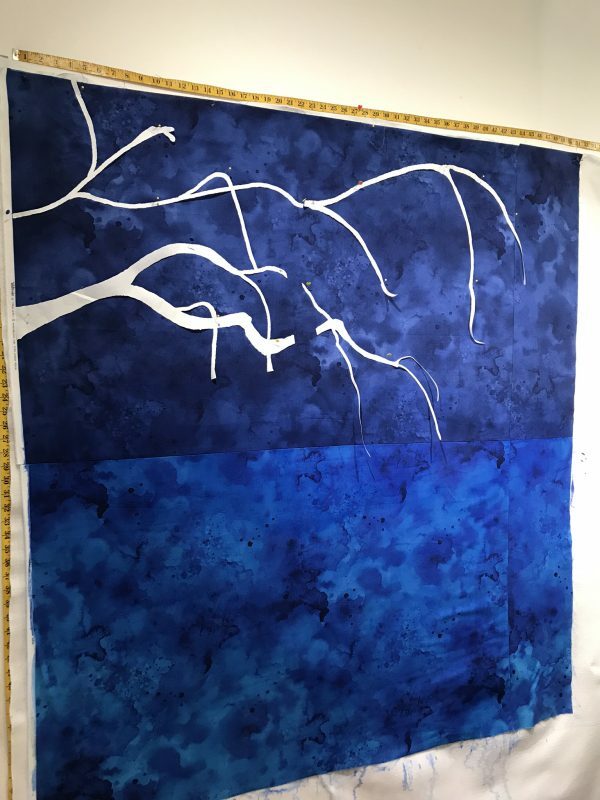 At this point I decided to paint the branches of the tree instead of using fabric. I wanted them to glow in the moonlight so I used Pro Fab Pearlescent Paint in black and pewter. These were then later thread painted with black and metallic silver thread. I was completely stalled about how I was going to make the cherry blossoms. 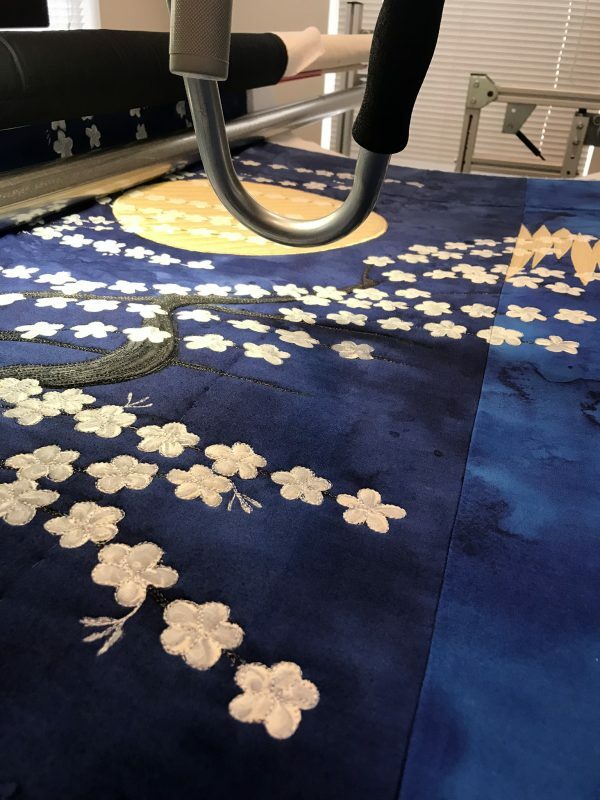 I usually use Evolon, a non woven, for very detailed applique but I just couldn’t wrap my head around how I would differentiate between stems and blossoms. I also would have had to paint them all anyway so I thought, “Why not just paint them”, and bag the Evolon. I checked out some YouTube videos on how to paint cherry blossoms, and learned a lot. I definitely felt a lot of fear about doing this but just decided to jump right in. I know cherry blossoms are usually pink but I use poetic license here because the white looks so much better with the intense blue. I was pleased with the result but it was very tedious. The painting went on for a few days during which time I also turned my ankle so standing on a stool was out of the question. I did the rest of the painting sitting down at my cutting table. 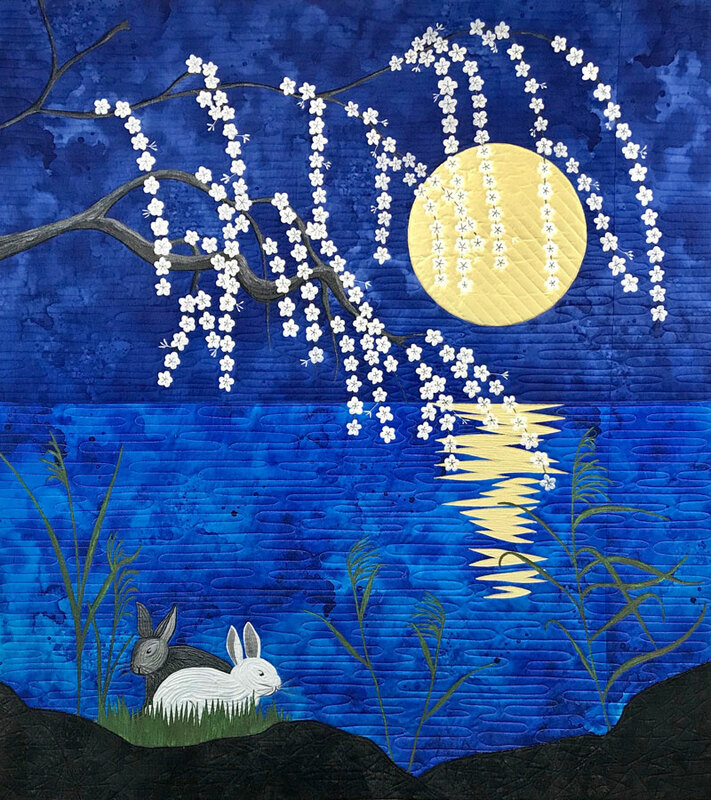 I was going to town on the cherry blossoms and then realized I had forgotten to make the moon reflection in the water. There went about 10 blossoms which would have to be repainted again! 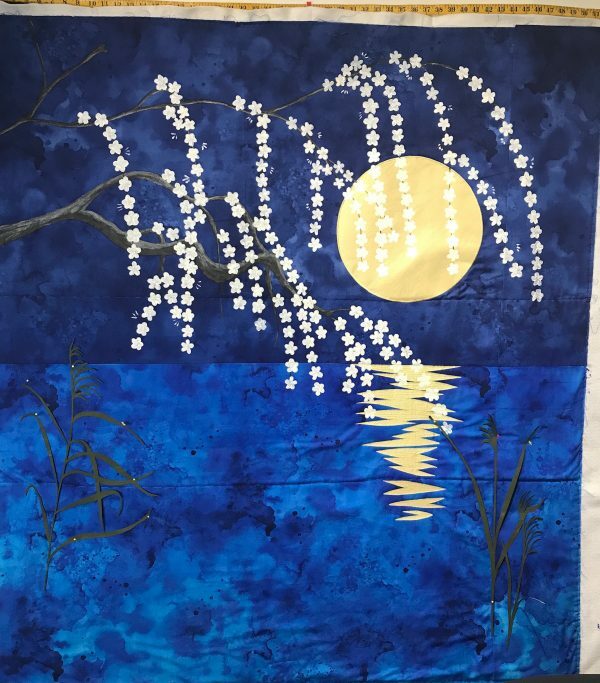 I cut the reflection out of the same silk as the moon, this time, just stitching it down with raw edge applique and stitching over it like crazy. I also had intended to have the whole quilt covered with many more blossoms so hadn’t pre-quilted the background like I usually do. 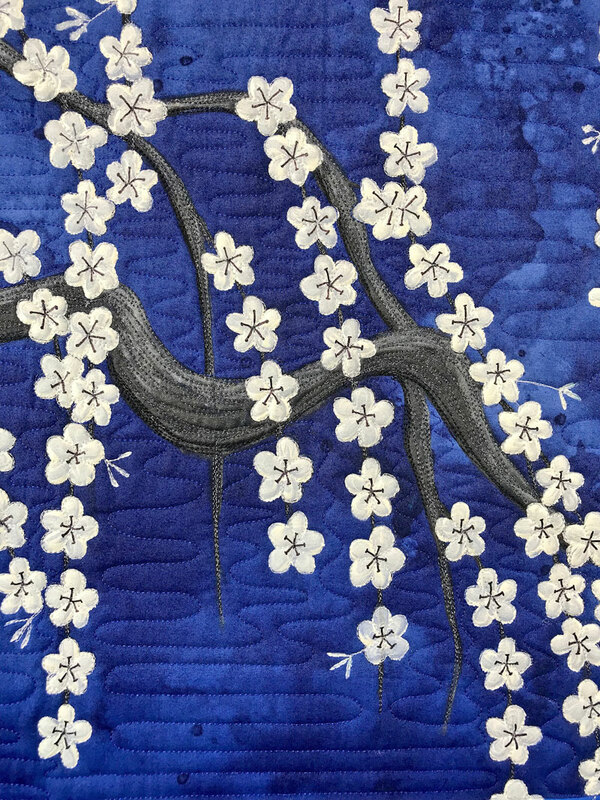 Considering how time consuming and tedious the painting of cherry blossoms had become, I stopped and just quilted what I had so far. I did have to stop and start a lot between branches but it wasn’t too awful. 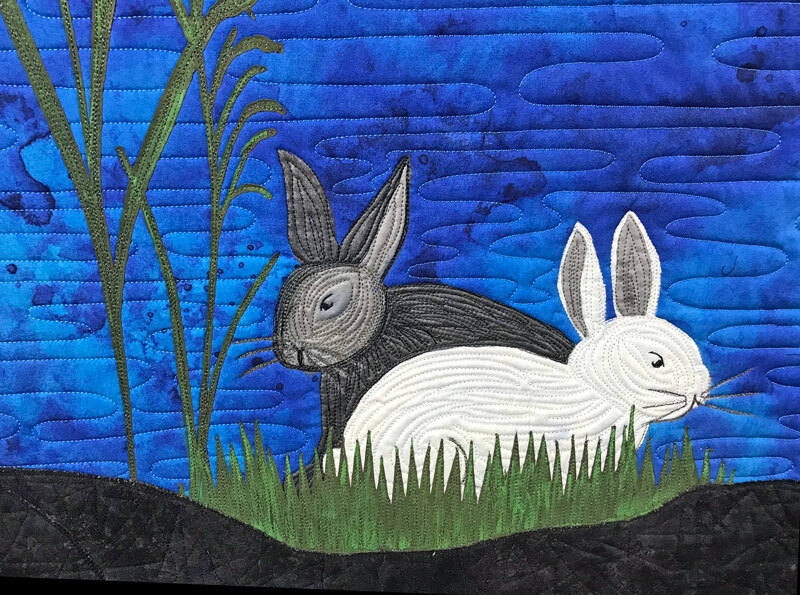 I roughly chalked in where I intended the rabbits to go and quilted the rest of the water before adding all the grass and painting the rabbits. I did several sketches of rabbits before deciding how to paint them. I did cut the tall grasses out of Evolon paper painted a dark olive green. When I pinned them up they were too dark so I got out my Intense pencils and gave them some lighter green highlights. A bit more dark green Evolon hand cut to partially hide the rabbits and make them look more grounded helped. The rocks at the bottom are a dark Northcott Stonehenge fabric, my “go to” fabric for rocks. I stitched all the grasses and rabbit whiskers with silver metallic thread to make them more noticeable. I stitched around all the blossoms. I found this to be a seemingly never ending task! The stamens of the blossoms were just added with black Sharpie marker. Lessons learned from this project? Think through all the steps a little more before jumping in. I’m a good problem solver but the problems could have been avoided if I had thought it through a little more ahead of time. I’m happy with the result but am in desperate need of a massage! As some of you know, I grew up in Japan and a childhood song we often sang comes to mind. You may find the listing for this finished quilt here. If you would like more info on upcoming online classes please follow this link. Scroll to the bottom and receive my PDF Guide to the Bast Threads. You may also find my lectures and workshop listings here. I really enjoyed reading about your creative process and problem solving. It’s also helpful to know that real artists get nervous about making leaps of faith in their work. Thank you for this description of the process. Thank you so much and you are very welcome! Wishing you the best on your journey! 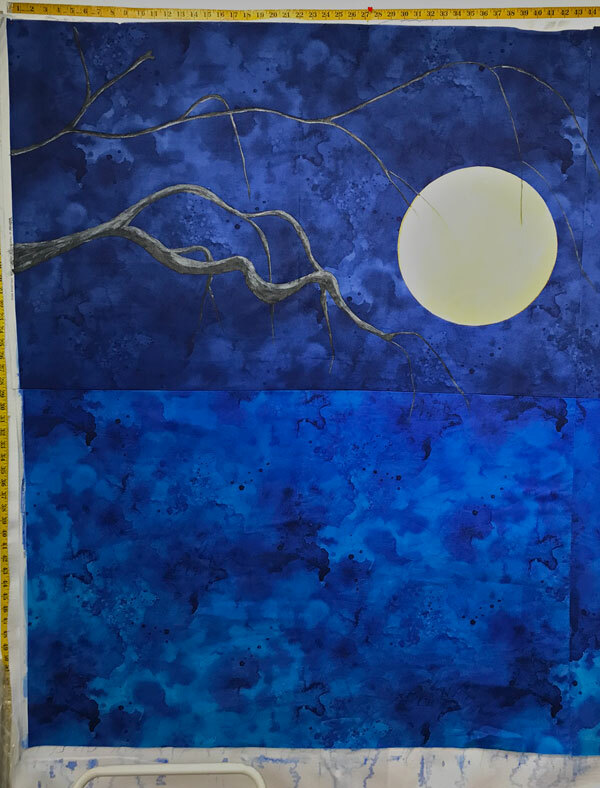 Wow, what an intense process and detailed quilt! It’s beautiful!